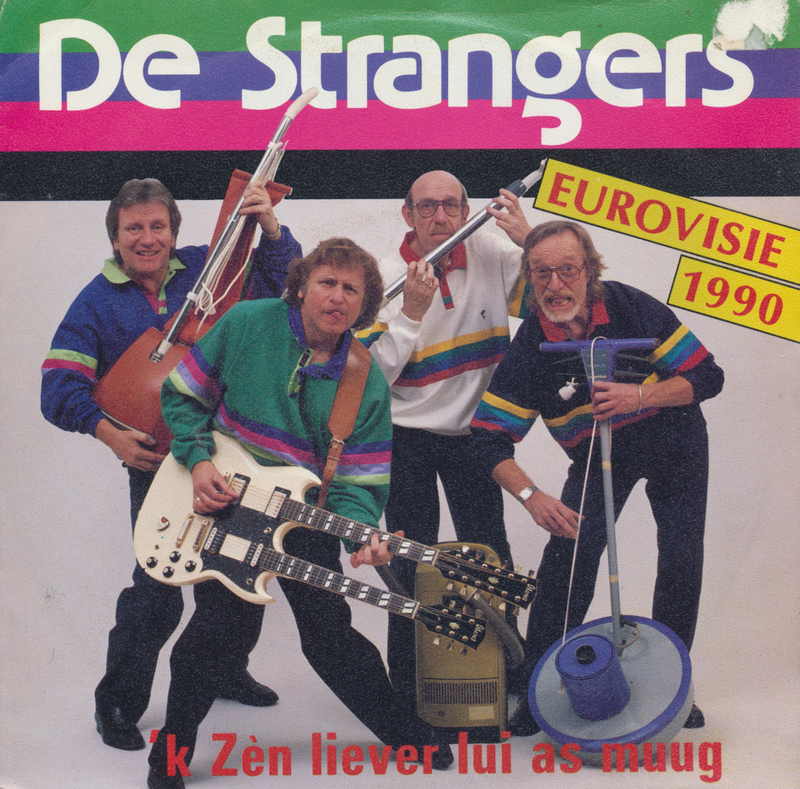 When Toto Cotugno won the 1990 edition of the Eurovision Song Contest with 'Insieme: 1992', the Belgian band De Strangers was quick to record a parody in their native language. Thus, ''k Zen liever lui as muug' was born. The title roughly means 'I prefer to be lazy rather than tired', and is another stab at Eurovision songs done in a different way. And yes, it's another addition to my growing collection of Eurovision covers. The Belgian band De Strangers are best known for their covers of Eurovision songs - on this blog anyway. I have bought quite a few of them on a previous visit to Chelsea Records in Antwerp, so when I went back in April this year, I found a handful more and I got them all. Sometimes I wonder why, but it's a collection of rare cover versions that you won't easily find anywhere else I guess. 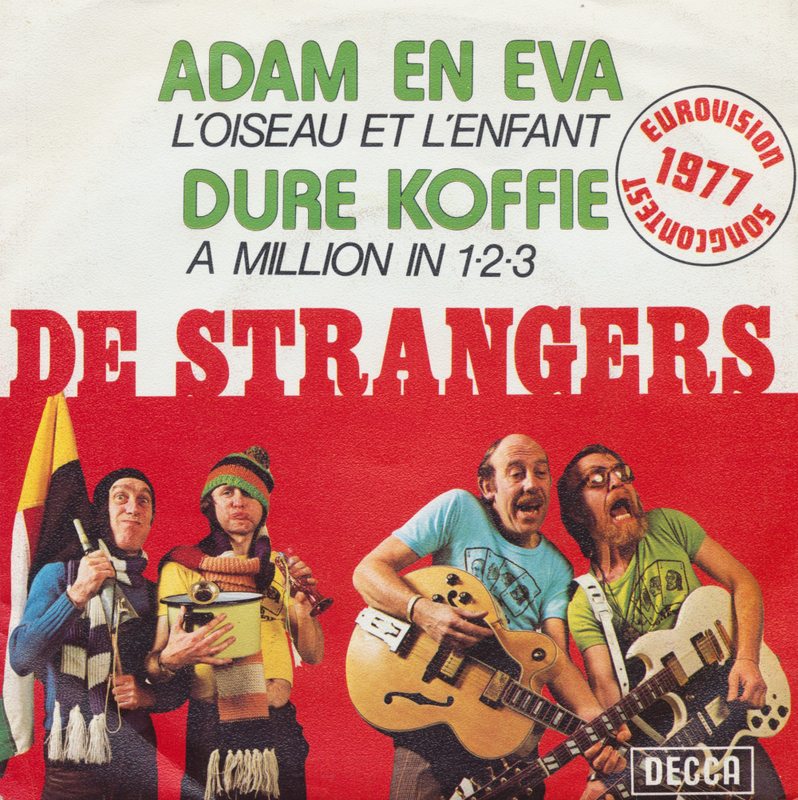 This single features two Eurovision songs from 1977 with new Antwerp dialect lyrics by the band: 'L'oiseau et l'enfant', the year's winner, and 'A million in 1 2 3', the year's Belgian entry. Quite why these songs are suddenly about Adam and Eve and expensive coffee respectively is beyond me, but there you go. 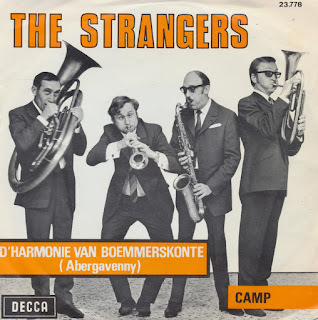 The Belgian band The Strangers have featured on this blog several times already, but this single was a huge surprise for me: a cover version of Marty Wilde's 'Abergavenny'. There aren't that many covers of the song, especially not in the Antwerp dialect. Like all their other cover versions, the Strangers have written their own lyric which has nothing to do with the Welsh city of the original song. And even for someone who understands Dutch, it's hard to find out what this lyric is about because the Antwerp dialect is pretty hermetic. So I guess it will remain a mystery. Nice music, though. 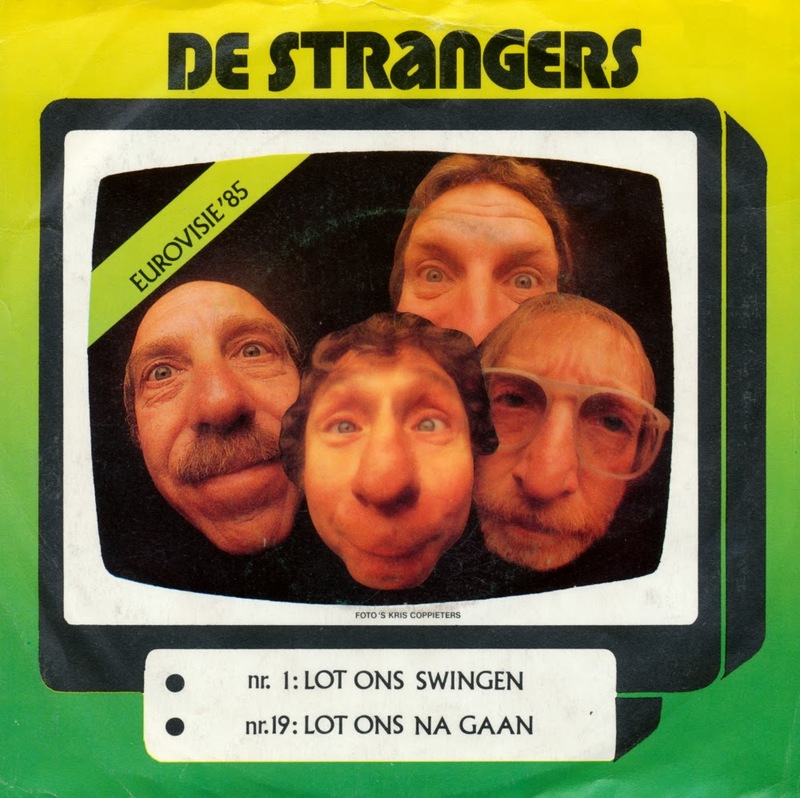 The Belgian band De Strangers have appeared on this blog a few times before, because I bought five of their singles all on one day. 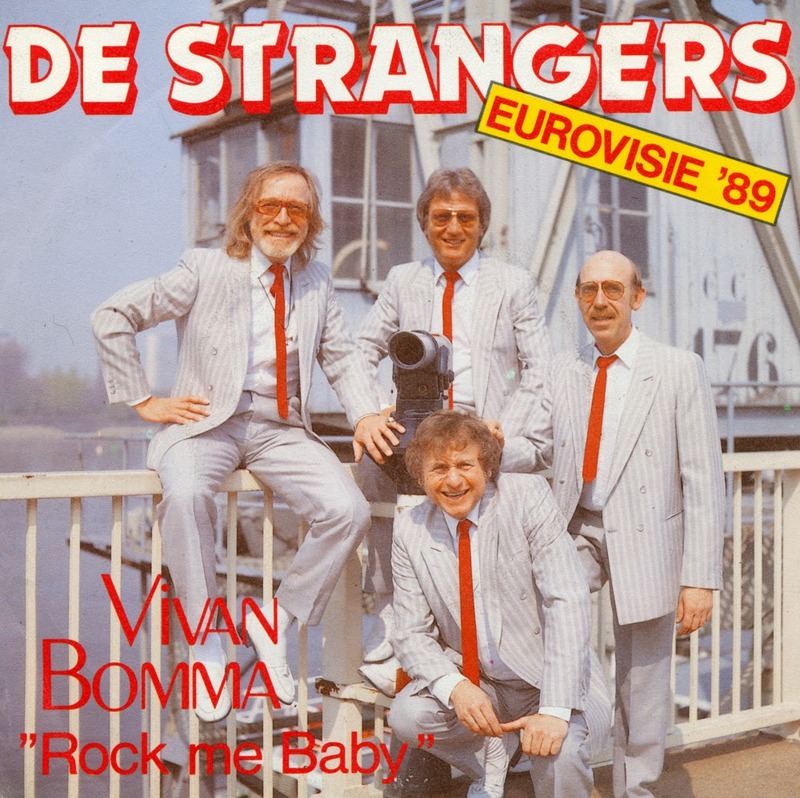 This is the last of that series: their 1989 cover version of Riva's 'Rock me baby', the song that won the Eurovision Song Contest that year. 'Vivan bomma' (who knows what that means? 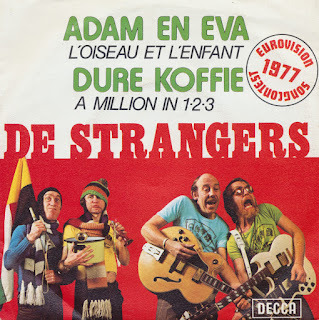 I sure don't) was not a hit for the Belgian group, and they never had any chart hits ever since either. They had their last concert on May 14, 2002, followed by a one-off reunion concert in 2006. The Strangers are a Belgian band, hailing from Antwerp. They became famous for singing satirical lyrics on wellknown hits. The band was formed on May 8, 1952 by Gust Torfs, Alex Boeye, Pol Ballansee and John Dewilde. In the early days they would perform in standard Dutch, but they soon moved to performing in Antwerp dialect. Some of their hits were derived from Eurovision hits, and I recently managed to buy several of those... in Antwerp, of course. The first of these is 1976's 'Naa moette traawe', a version of Eurovision winner Brotherhood of Man's 'Save your kisses for me'. The B-side was their version of that year's runner-up 'Un deux troi' by Catherine Ferry. 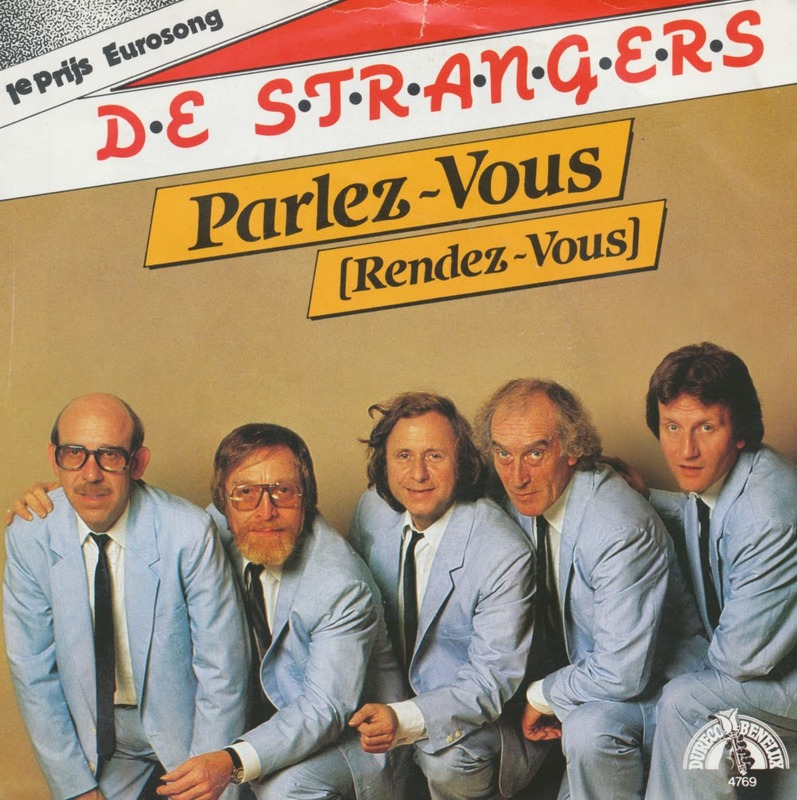 This single reached number 17 in the Belgian singles chart.